But – the wet weather commuting brings its challenges: namely staying comfortable (reasonably dry and warm) while riding. During a summer rain, I don’t mind just getting wet, especially during my commute home. 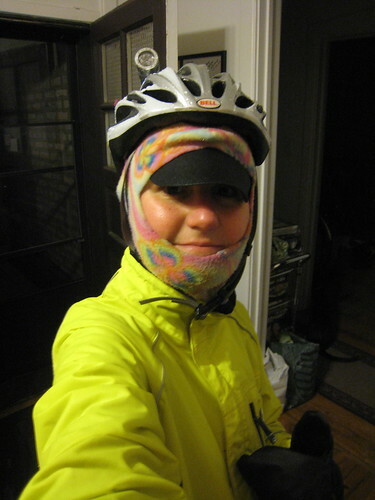 But when the thermometer reads 39-degrees and the wind is whipping out of the northeast and in my face at 15mph (gusts up to 35mph), I must strategically dress for my commute. 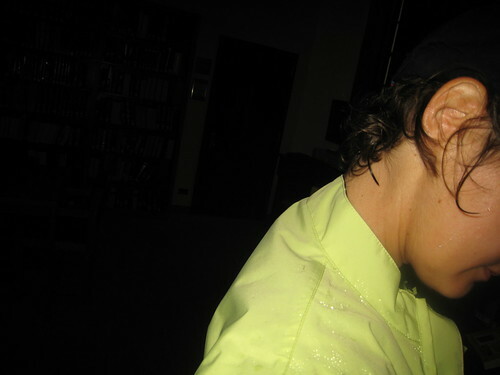 * first thing I put on was my cycling cap with visor to keep the rain out of my eyes. * on my hands I wore simple wool gloves I picked up from an army-navy surplus store, covered by an outer windproof, water-resistant lobster style shell mitt. My visor had done its job of keeping the rain out of my eyes. My waterproof pants performed excellently; too bad they aren’t cycling-specific… as they could have been a bit longer with better movement in the knees, but my legs were dry and they breathed well. Seems the my waterproof jacket needs to be re-waterproofed. Thinking back, this jacket is two-years old, so it is time to wash and reapply a waterproof coating to the jacket. 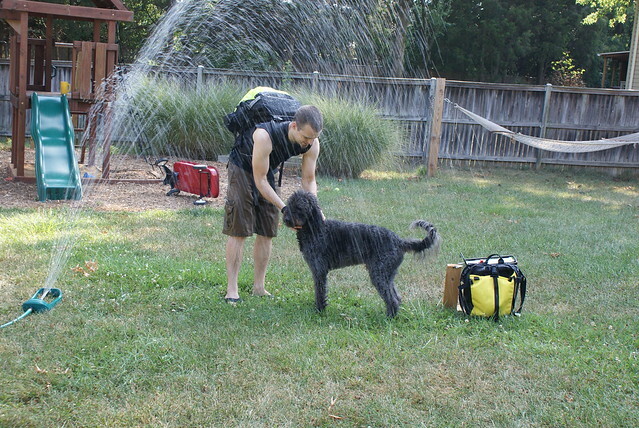 Water had seeped through to my arms but the rest of my torso did remain dry. Luckily, I was home, so I quickly changed into dry, comfortable loungewear for the night. Earlier in the day my mom had sent me an email after her wet, messy morning commute (by car) saying “I thought about you as I drove … in the rain. I don’t know how you do it! Ride to work in the rain.” I responded that my commute was invigorating and so much more enjoyable than being stuck in a car (or a bus) – at least it seemed that way from the glum looks on peoples’ faces in their cars or waiting at the bus stops I pass along my route. 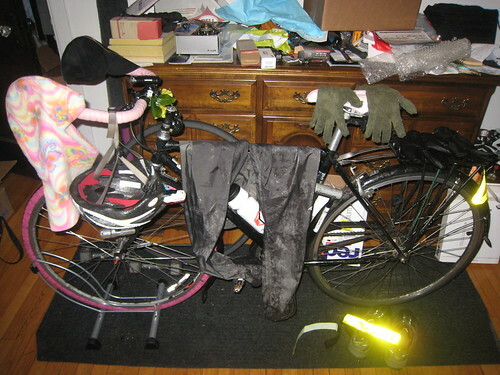 Overnight, my bike served as a drying rack for all my gear to dry before my commute today. And today I’m recharged for another day – dry! – of bike commuting. What are your best stay dry/warm tips for this season? 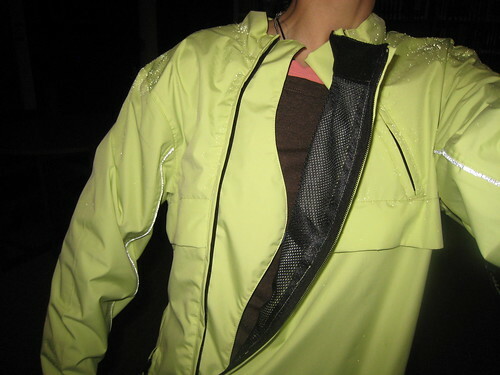 When the weather first started turning cooler and wetter last fall, I began testing a new waterproof jacket from the women’s mountain bike clothing company Loeka. This company makes women-specific gear primarily for mountain bikers, but this jacket is designed with commuters and everyday riders in mind helps them achieve their mission to simply “help build a strong community of female riders from beginners to professionals by encouraging more and more females to try/take up cycling.” With this jacket, the nasty elements certainly are one less excuse to not get out and ride. And with this company’s attention to fashion, riders will definitely be getting compliments on their chic “look”; I know I have received more than a few compliments while wearing this jacket (never before received while sporting my other waterproof commuter jacket) – nice! It certainly holds up its end on being waterproof! After a rainy ride home you can see that all the water beads up on the surface and kept me dry underneath. 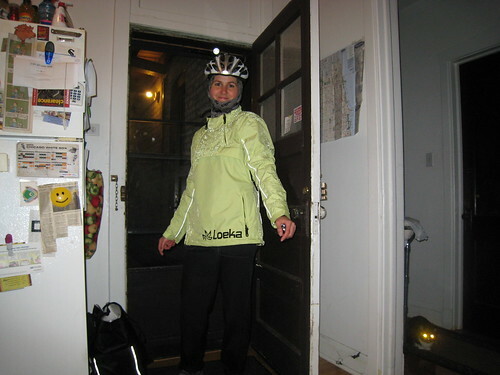 Originally I received this Loeka commuter jacket when the weather was still wonderfully warm and pleasant and couldn’t start testing until the fall/winter weather descended upon Chicago. The cut on this jacket is long enough all the way around so as not to allow nasty road spray sneak up on your rear (not a longer tail on the back) and you can see how it fits while on the bike. 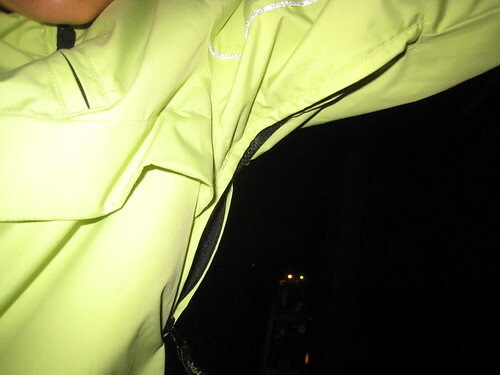 This jacket offers bike commuters/around town riders waterproof/weatherproof protection in a fashion-forward design. Unlike my previous waterproof jacket designed in a more (non-stylish) unisex manner, this shell offers the same 3-season protection from rain or snow or clear, cold and windy days – basically to “tackle all the not very nice weather” with a unique look. The most obvious feature that stands out is the angled zipper down the front (as opposed to all the other commuter jackets that have a straight zipper down middle front of the jacket). Beneath this zipper, a windproof flap (in a curvy design) blocks any wind/rain from sneaking through the zipper. This angled full zipper down the right side of the jacket is balanced on the the left with another small zip at the neckline that not only provides visual symmetry to the design but also (according to Loeka) helps to provide easy ventilation while keeping you protected from the elements. Personally I found the ventilation offered by this smaller zip to be negligible at best, but visually it succeeds from a design perspective. There are also ventilation flaps on the front side of the jacket (along the chestline) but no equal venting on the back. Luckily the lack of the rear venting is not an issue since this jacket does boast the essential pit-zips for added ventilation – and I appreciated their length and the added breathability they offered to prevent overheating. From the functionality perspective, this jacket sports a hand pocket on either side of the angled zipper; the left side pocket reaches across the jacket and offers ample room for gloves, keys, etc – just don’t put too much in it since it stretches across the belly area in the front. The right-hand pocket (though small due to the angled zip) provides just enough room for your keys or any small accessory. At first I missed having a handy chest pocket which I’ve had on other jackets, but I soon came to appreciate the pockets at hip level (especially when just walking around town on my lunch break). 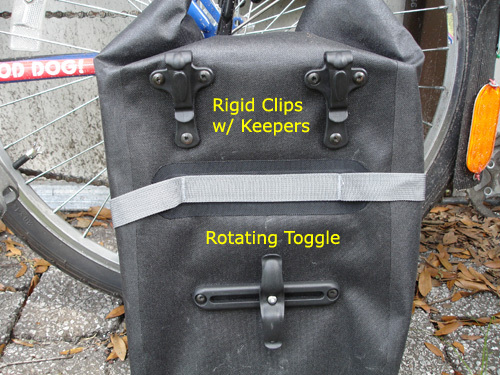 There is also a rear zippered pocket (covered with a flap) to store extras while riding (cell phone, snack, etc) that doesn’t call attention to itself when not in use. Loeka purposely left the neckline a bit looser to help accommodate a layer underneath comfortably and for 2010 they have made the neckline closer and not so loose. For the coldest days, I really appreciate the ability to comfortably layer-up under this jacket. All photos on their website reflect these adjustments for their 2010 line. Lined with 100% polyester mesh. Waterproof up to 10,000ml with taped seams. 8,000ml breathability, armpit zippers and natural chest vent. Reflective piping built in to back panels and sleeves. Adjustable wrists and rear zip pocket. According to the owners of Loeka, the jacket should easily last 3-5 years of heavy use if properly maintained or even longer. If the jacket is being worn occasionally then it could last who knows how long. For care instructions, please see their site for care info which basically directs using a sport wash like Nikwax or Grangers to help keep the waterproofing last. Then hang dry, do not tumble dry. A few weeks ago, I posted a “first look�? 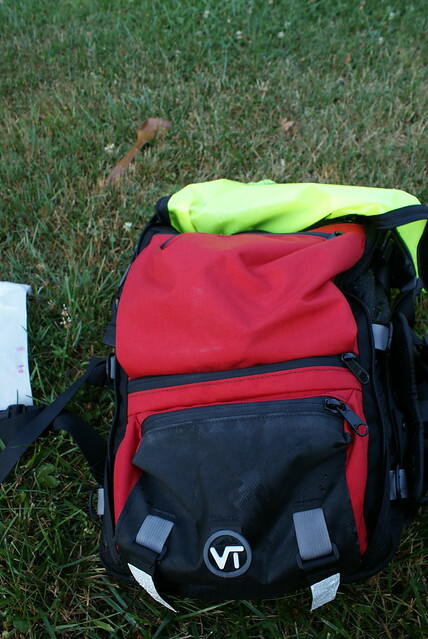 at the Seattle Sports Fast Pack waterproof pannier. 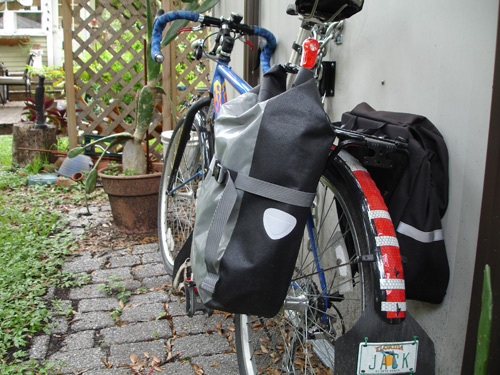 I’ve had a chance to really ride with this bag — and I LOVE it!! The bag has carried some heavy loads (dress shoes, a stack of big library books, groceries) and has remained absolutely waterproof through some brutal late-summer Florida rainstorms. I also really enjoy the ease with which I can open and close the bag to fill it and remove items. 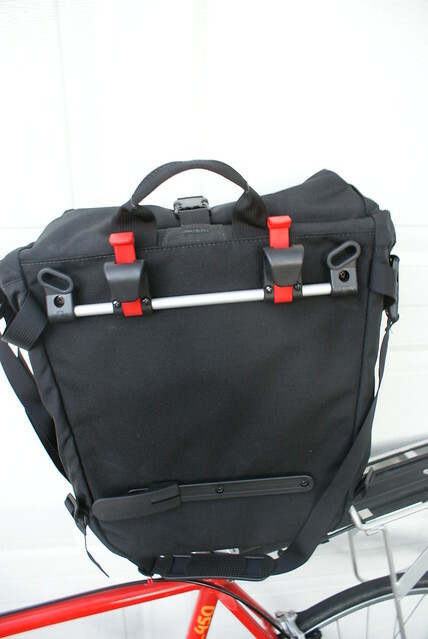 I was using some cheapie Nashbar-branded panniers before I got this bag to review, and with that one I have to unclip two buckles, flip open a flap and then undo a drawstring to get at my goodies. 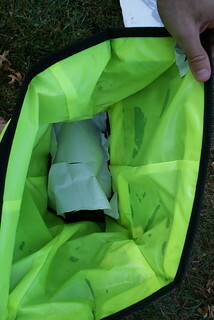 With the Seattle Sports pannier, I merely unclip the buckle and roll the top twice to open it. Reclosing it is just as simple — two quick rolls with my wrists, clip the buckle and I’m off! 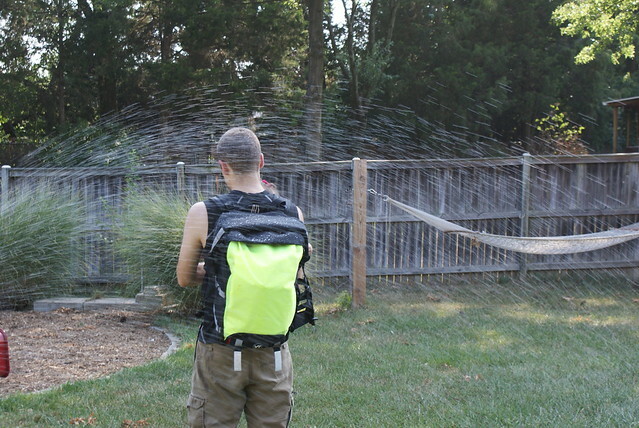 The fabric, besides being completely waterproof, has also proved to be quite durable. It doesn’t show any signs of wear, even after I scraped that side of the bike against a narrow concrete passageway I sometimes pass through on my way to work. Sharp corners of books that I’ve carried haven’t damaged the bag in any way, either. I still dislike the inky black interior of the bag — I wish the bag was lined with a lighter-colored material to help me find small items in the bottom, but in practice this really hasn’t caused me any problems. 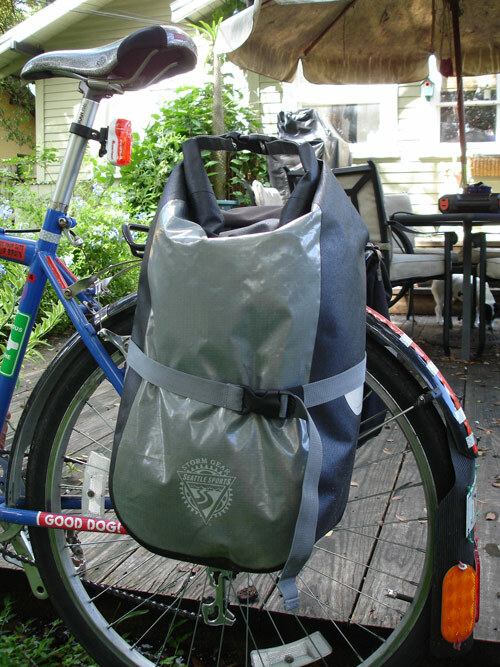 In any case, this Seattle Sports Fast Pack bag appears to be just the ticket if you have stout commuting loads, live in wet areas and are tired of your other panniers flapping and jingling as you ride. 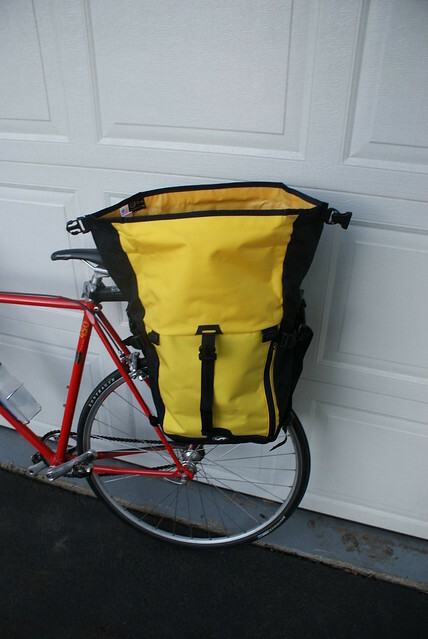 For more information and pricing, take a look at Seattle Sports’ bike gear page. Now, if I could only scrape together enough cash to buy one for the other side!